Before you begin the Pi-Pan assembly, install the required software and bring the Servos to Neutral Position. To install software on Raspberry Pi, follow instructions from this page. Screw W - 2 5/16” Screws with collar, (to fasten servos to plate C/D) in each servo ziplock. Screw V - 2 No-2 5/16” Screws (to fasten plate A to B) in small ziplock. Screw Y - 2 No-1 3/16” screws, (to fasten camera to plate A), in small ziplock. Screw Z - 4 No-0 3/16”, (to fasten servo horns to plate B/base), in small ziplock. 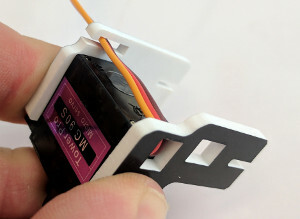 Note that while mounting servos, the Front mount plate (plate C) is on the side of servo wires, as in adjacent picture. Attach the mount plates C and D to one of the servos and fasten the servo screws (W),(do not overtighten). Attach the second servo, and fasten servo screws (W). U-Turn the wires at the rectangular holes on plate (do not insert through those holes). Tuck the servo wires through the holding slit on the mount plate D. The Servo head assembly is ready now. We will be using adjacent horns for the servos. You should find it in your servo ziplock bag. (Remaining horns are not used). Affix the horn to Plate B as shown below, use screws (Z). Ensure to affix horn on White side of Plate B.
Fasten 2 (Y) screws to plate A in the corner holes, as shown. Before you place the camera board, make pilot thread by just using the screw. (tighten the screw fully and remove it). While you tighten with actual camera board, cover the camera board circuit to prevent accidental damage from run-away screwdriver. Attach mount plate B to plate A as below, and fasten with screws (V), do not over-tighten. 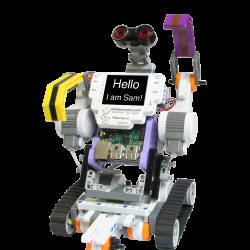 Note the servo on which the camera head will be mounted (Orange arrow). Ensure that you have neutralized servo position before this step. Attach the horn of Camera head to servo shaft and fasten using screw (X). Pan-Tilt assembly is now ready to mount on target platform. Follow the instructions here to mount it on the target.